Claypot Lou Shu Fun is another Malaysian’s favourite noodle dish and is frequently sold in most coffee shops and street food restaurants. However, this delicious and flavourful dish is so simple to make, you can actually cook it at home and a delicious yet piping hot one meal dish will be ready in no time! Maybe a good idea for a simple weekend lunch or dinner too. Lou Shu Fun (老鼠粉), also known as Silver Needle Noodles or Bee Tai Bak (米苔目) is a variety of Chinese noodles. It is white in colour and semi-translucent, made from rice flour and cornflour. Hence, the smooth and shiny texture. The noodles are stir-fried with a generous amount of minced meat and shiitake mushrooms, then served in a heated claypot. 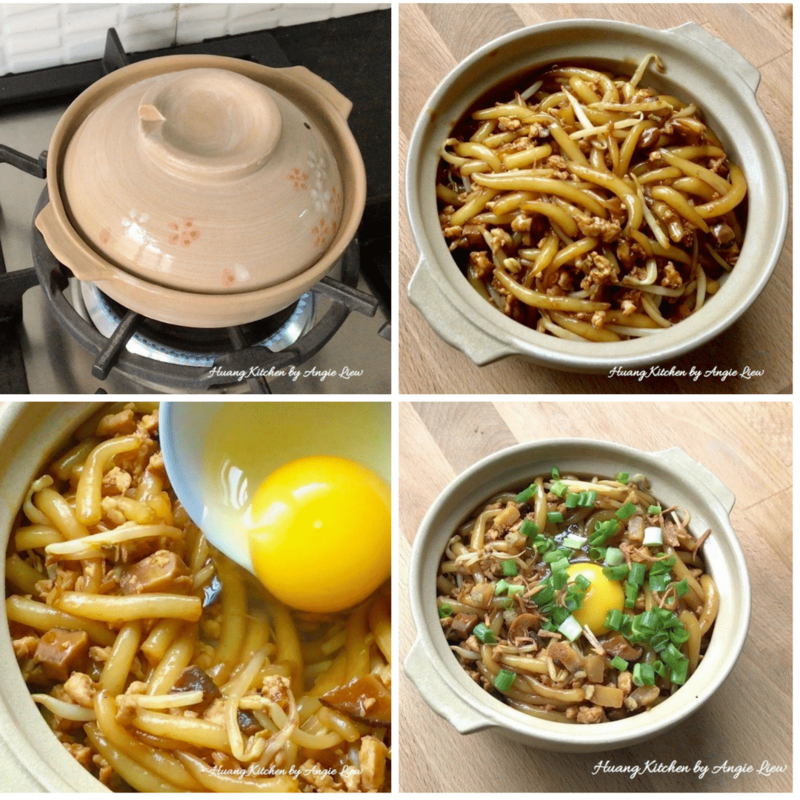 The claypot helps to retain heat so the stir-fried noodle remains tender and smooth in the claypot. 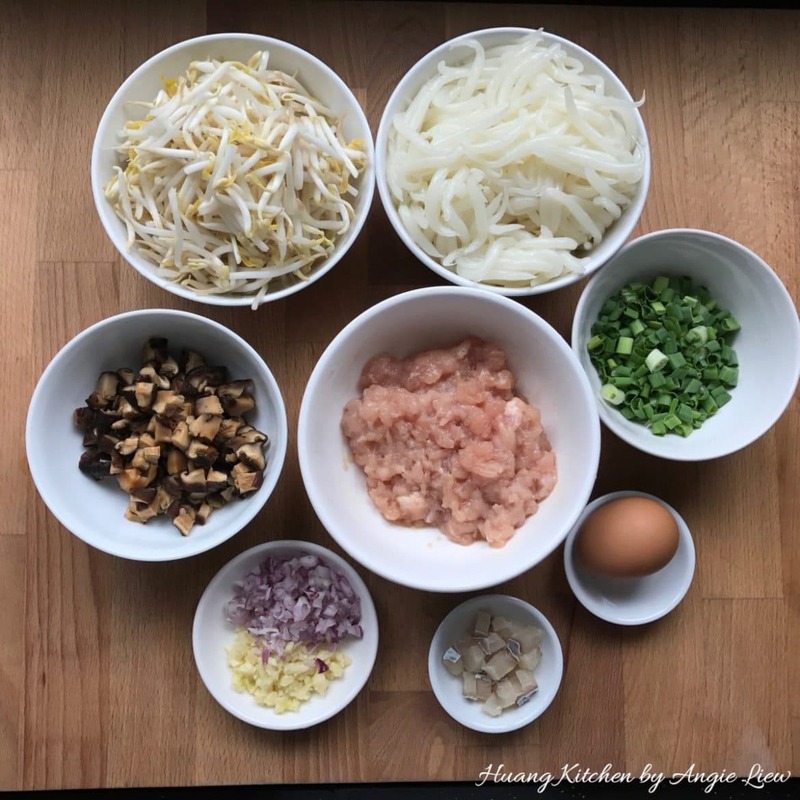 Just before serving, an egg is usually cracked on the top and cubes of fried salted fish are drizzled alongside it, making the noodle dish extremely appealing for the eyes as well as our tastebuds. 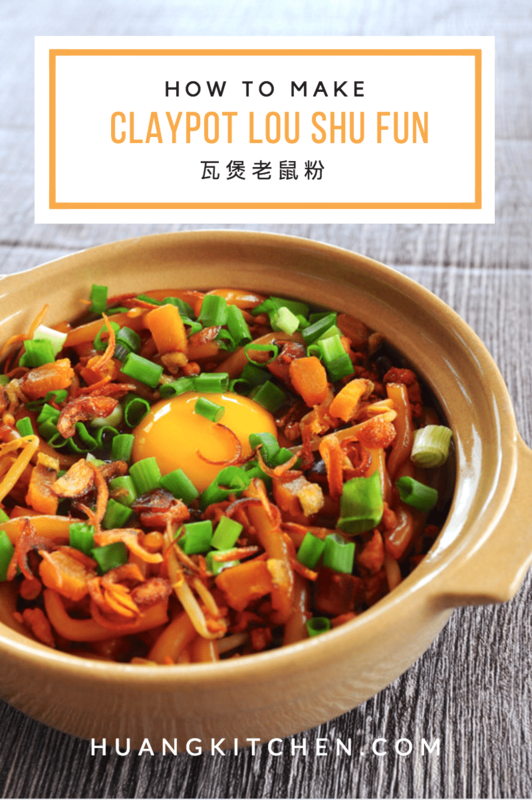 The topping of the egg is the crowning glory for the claypot lou shu fun … a MUST have! Certainly a fantastic noodle dish, not to be missed. Best served with Pickled Green Chillies (click here to see recipe). 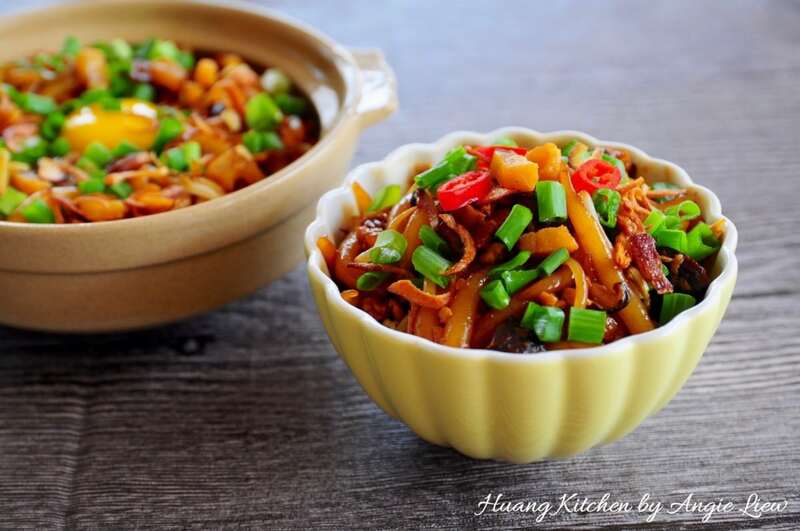 A Malaysian favourite: Lou Shu Fun noodles stir-fried with a generous amount of minced meat and shiitake mushrooms, seasoned to perfection, then served in a heated claypot. Finally, fried salted fish and a raw egg to top it off. 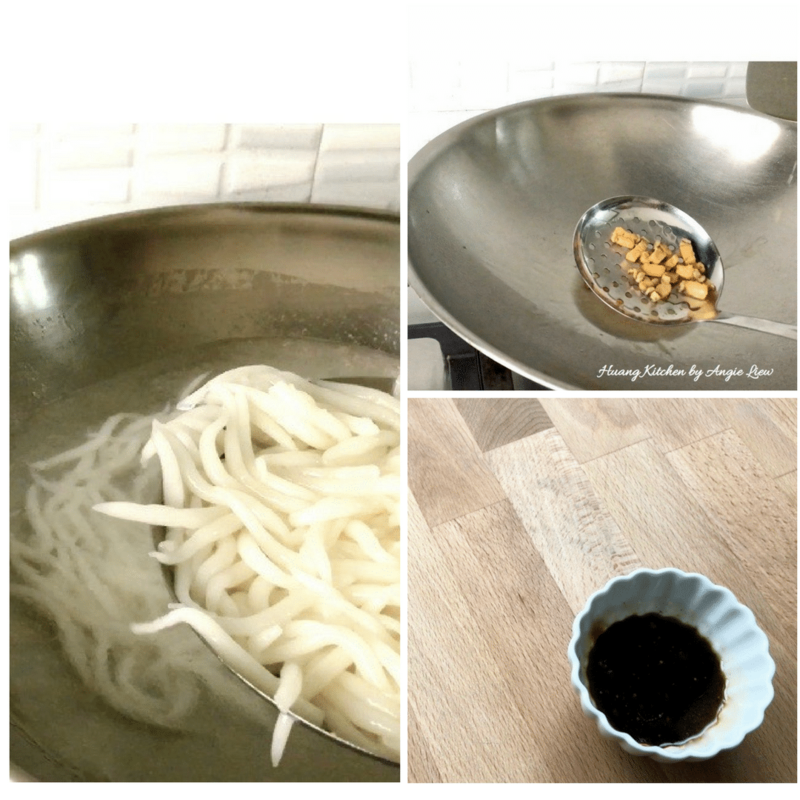 First, wash and drain well rice noodles and beansprouts. Mince and marinade meat. Soak, drain and dice shiitake mushrooms. Cut some salted fish into small cubes. Lastly, mince shallots and garlic. Then blanch the noodles in boiling water for about 2-3 minutes just to remove the oil on it. Dish out and drain well. Next, deep fry cubed salted fish till golden brown and set aside. Mix all seasonings in a small bowl. And we're ready to stir fry the noodles. 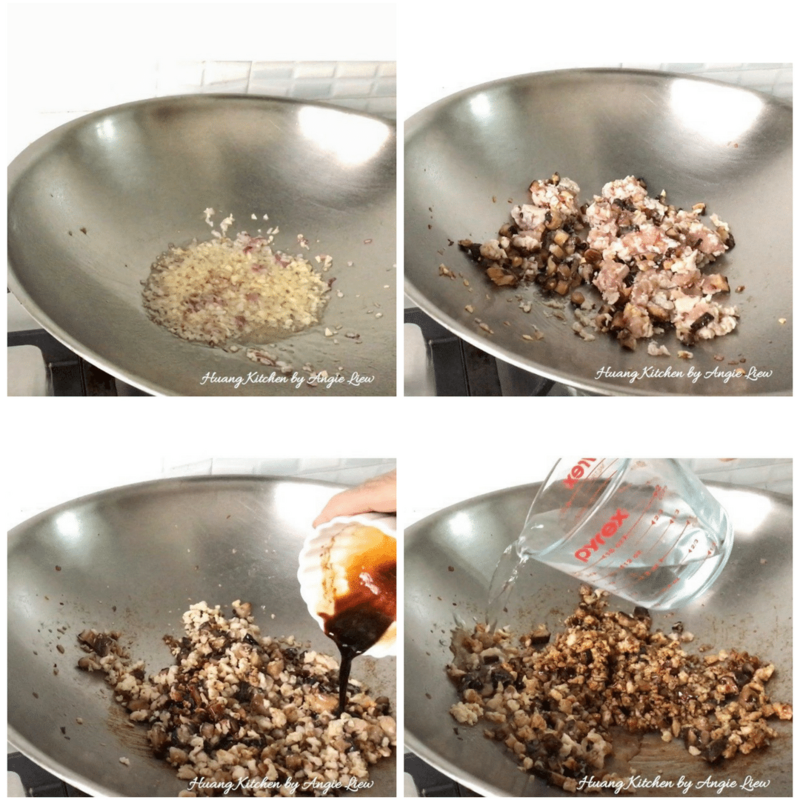 First, heat up 2 tbsp oil (from the deep fried salted fish) and add in minced garlic and shallots. Saute till fragrant. Then, add in marinated meat and diced shiitake mushrooms. Continue to stir fry till aromatic. Next, add in the seasoning mixture and water. Stir fry everything together and bring to a boil. Add in the blanched loh shu fun and beansprouts. Toss to mix the noodles with the meat, beansprouts and sauce. Adjust seasonings to taste and stir fry for another 2 minutes. Dish out and we're done! Just before the fried noodles is done, heat up claypot till hot. Then, transfer the fried loh shu fun into the heated claypot. Make a well in the centre of the noodles and crack an egg on the top. Garnish with fried salted fish and chopped spring onion, close the lid and serve right away. 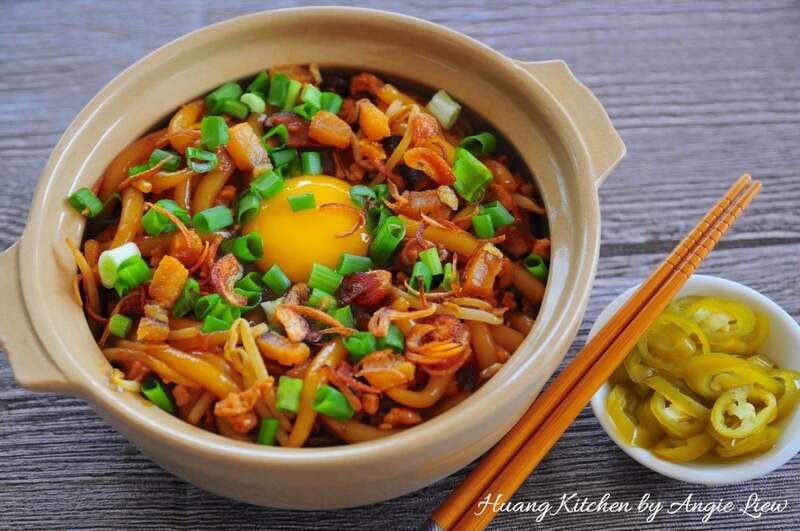 Stir the half cooked egg around the hot noodles just before serving and ENJOY!